With the addition of Paige Carratturo and the Enertech team, Momenta’s Quantal Search practice expands our talent footprint, especially for deep talent. In Part 1 of this series, Paige discussed the energy industry’s transformation over the past decade, and the interesting dichotomy behind the ascendance of clean power as the interests of idealists and pragmatists converge. She also clarified why investing in energy projects differs from traditional growth-oriented VCs. 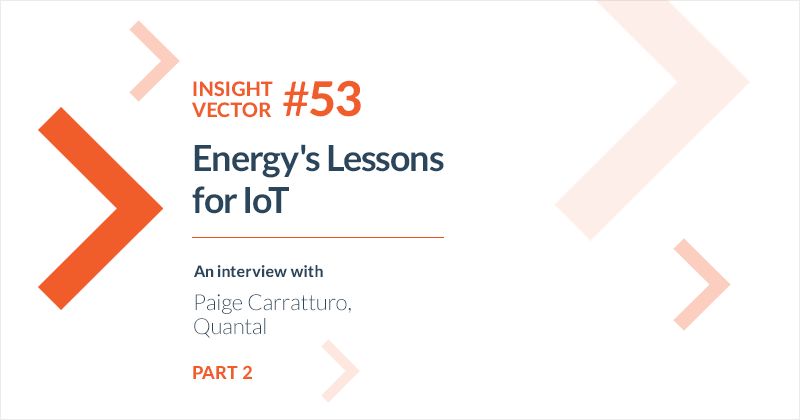 In Part 2 of our discussion, Paige expands on the learnings of the energy sector and how they could be applied to other sectors. She also details the driving forces for digital transformation within the industry. What are some lessons from energy transformation that could be broadly applicable? Culture is an issue for a lot of companies with an aging workforce that didn’t grow up in a digital world. The people that are running the business are not those that will transform it. There are two potential options for a digital paradigm shift - it’s either generational, or companies like ABB bring on someone like Guido Jouret [listen to the Moment Edge Podcast here] in order to specifically drive transformation. Old economy industries, like energy, are going to need a talent pool that can drive digital transformation both top-down and bottom-up. Often, these industries are very pension-driven, so there’s a lot of inertia and resistance to change which has to be dealt with. The ability to recruit truly transformative talent is critical across the organization, not just at the top. What are the most important dynamics in the market today? In energy, there are multiple driving forces around the continued acceleration of digital transformation. Our current political environment is populist and pragmatic and is driven by security, impact, resources, and how to become competitive economically. The other is the backlash against the current political environment, with the more mission-driven consortium doubling down on climate change initiatives and discussion is the public sphere. In a way, both sets of interests have converged, both are highly motivated by their agendas, but if they can find a few points that are meaningful to both sides, then clean energy will continue to become less politicized. In the past 10 years, clean energy has become more mainstream, all of the natural disasters and lack of resiliency have highlighted the risks of failing to upgrade the grid. More people are cognizant of how critically important it is to get this right, both from an industrial digitization perspective in order to have security, resiliency and economic advantage, but also to understand that distributed clean energy resources are here today, and we need to include them in a very complex and aging infrastructure. When we were speaking with Momenta, we realized our experience in energy is so perfectly aligned to help industrials, smart cities, and logistics navigate their digital transformation. We believe the people that lived through the energy revolution are positioned to help other industries going forward. We were motivated to start Quantal as we saw the need for a new talent acquisition service. We wanted to address the industry need for Deep Talent - those that are designing, activating and operationalizing disruptive technologies across the Connected Industry including data science, blockchain experts, augmented reality developers and associated operational and commercial teams. There is an industry demand, and by joining forces with Momenta Partners, we can expand the digital transformation of energy over the past 10 years into broader industrial markets.